We began receiving the "Retrieve a ticket to register the Virtual SAN VASA Provider" but don't have vSAN installed. What's going on? I found this article and could simply disable the vSAN Health Service. 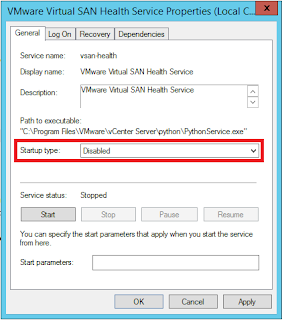 Locate and "VMware Virtual SAN Health Service" service and click Stop. Double-click the VMware Virtual SAN Health Service to open its dialogue box. Log in to the vCenter Server Appliance via SSH and activate a Bash shell. For more information on logging in to the vCenter Server appliance, see the Using the Appliance Shell to Configure the vCenter Server Appliance section in the vCenter Server Appliance Configuration guide.